As Phyllis' family, friends, and fellow Christian disciples gather to honor her memory, to grieve together, to laugh together, and to draw strength, hope, and encouragement from the God we know in Jesus Christ, it’s good to remember that today is Holy Saturday...and Easter is coming! On the first Holy Saturday, you know, Jesus’ lifeless body lay in a tomb. 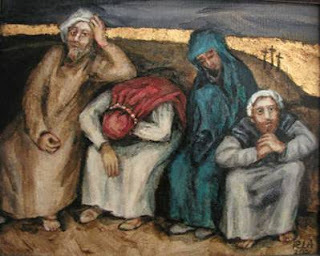 Jesus' first disciples were left with their grieving thoughts. What would they do now? How would they cope with the void? For those first disciples, Saturday was hard and sad. And no matter how grateful you may be that Phyllis’ battle with an implacable enemy has ended and that her suffering has ended, for you, in many ways, you experience this Saturday much of what the first disciples experienced on that first Holy Saturday. It’s a day that’s hard and sad. There is a void in the lives of those who called Phyllis mom, grandma, great-grandma, aunt, sister, friend, fellow believer. The love, the infectious laugh, the good story, the unshakeable devotion to family: all of these things are irreplaceable. Phyllis is irreplaceable. But take heart, though it’s Saturday now, Easter is coming! In the eleventh chapter of John’s Gospel in the Bible’s New Testament, we’re told about the reception Jesus received in Bethany from his friend, Martha. Martha’s brother Lazarus, also a friend of Jesus, had died. Martha was upset that the One they had come to see as Lord, Jesus, hadn’t been there when Lazarus was suffering. Jesus hadn’t been there at the moment of Lazarus’ death. It’s not clear what Martha believed exactly when she made that statement. What is clear from the rest of her conversation with Jesus is that she had no idea that Jesus was about to raise Lazarus from the dead. Despite her grief over her brother’s suffering and death, despite her anger and frustration with Jesus that Jesus had not come sooner, and despite not knowing what might happen next in her life, Martha still trusted in Jesus. And this, when I think about it, was one of Phyllis’ remarkable qualities. At the end, she didn’t deny the frustration or the pain of her circumstances. (She told me last week that the morphine took "some of the pain away.") Yet she kept going in faith. And, she didn’t make the mistake of blaming God for having a disease that exists because we live in a fallen and imperfect world--a Holy Saturday world. She still trusted in the God we meet in Jesus. That’s why she listened to Luke’s account of Palm Sunday as I read it to her and talked about it with me for a few minutes, as we always talked about Scripture when we met. It’s why she gladly received Holy Communion. Earlier in His ministry, Jesus had told an old teacher of the Jews, Nicodemus: “For God so loved the world that he gave his one and only Son, that whoever believes in him shall not perish but have eternal life.” Martha believed in Jesus. In purely human terms, that must have been pretty hard at that moment. But the Spirit of God stirred her to entrust her life and all of her hope in Jesus. Today, two thousand years later, we have far more reason to believe in Jesus than Martha did at that moment. That’s because, shortly after Jesus’ conversation with Martha, though He was sinless, Jesus voluntarily took the punishment for sin you and I deserve, by dying on a cross, killing off the power of sin and death over the lives of those who like Martha, and like Phyllis, believe in Jesus. You can trust a God Who dies for you because He loves you. But, we have even more reason to believe in Jesus. Things didn’t end on Good Friday, when Jesus died. They didn’t end on Holy Saturday, when His flesh and bones lay in a tomb. They didn’t even end on Easter Sunday, when God the Father raised Jesus from death. And today, Jesus, Who raised His friend Lazarus from the dead that day in Bethany, can raise anyone out of the prison of sin and death. Jesus can give eternal life with God that begins here and now as we trust in Jesus to be our God, King, Savior, and Best Friend. The promise of Easter belongs to all who turn from sin and the ways of this world and turn instead in faith to Jesus Christ. It’s a promise fulfilled for Phyllis that she will enjoy for all eternity. She is now in the presence of the One in Whom she believed, free from the confinements of age and disease, free from grief, walking and laughing and celebrating at the great heavenly feast with all the saints who have gone before, including the mother she lost when she was just a baby and the husband she adored. After I walked into the hallway, I wondered whether I should have said that. I knew that her condition was worsening, maybe I wouldn’t see her soon. Let the thought of Phyllis resurrected bring you comfort today. Let the example of her faith in Christ spur you to faith in Christ and to ever-deepening faith in Christ so that you too will know the resurrection with God. Today, it’s Holy Saturday. But in Christ, Easter Sunday has invaded this darkened world. On the first Holy Saturday, Jesus' body lay in the tomb and the disciples grieved as they observed the sabbath. Meanwhile, in the dominion of absolute evil, the realm of negation and nihilism, there was defeat. The evil one's ploy to take humanity and the universe eternally captive to sin, death, and himself, born of his resentments of God and humanity, had failed. Jesus Christ, the sinless One, has borne human sin, taking our death sentence, making it possible for God to offer new life to those who turn from the old world of sin, even as they turn to the new creation that belongs to those who repent and trust in Christ. Death, futility, and the evil one no longer have dominion over those who cast their sins and cares, their past, present, and future, on Jesus! But on that first Holy Saturday, no one in this world knew all these things. No one knew that everything had changed. So, some gloated, believing that they had ridded the world of Jesus. Some grieved. Most were indifferent. Sometimes God is acting and we don't see it. God is in control, with an eternity of blessings He showers on those who trust Christ and His love, who proclaim Him and pray in His name. When you feel overwhelmed by your sins or griefs, remember that in your soul, it may be Holy Saturday. But for all who dare surrender to Jesus, Easter is coming! Trust in him and His victory will also be yours! Maundy Thursday commemorates events that happened on the night of Jesus’ betrayal and arrest. The word Maundy is derived from the Latin word mandatum, from which we get words like mandate and commandment. That’s because in his Gospel, John tells us that on the first Maundy Thursday, Jesus said this to His disciples: “A new command I give you: Love one another. As I have loved you, so you must love one another. By this everyone will know that you are my disciples, if you love one another" (John 13:34-35). Previously in the Old Testament, of course, God had commanded that we love Him and love our neighbor as we love ourselves, commands that Jesus underscored in what we call the Great Commandment. But in His new commandment, Jesus tells His disciples that we must love our fellow disciples just as Christ has loved us. Jesus’ command is non-negotiable: No matter how much we Christians may drive each other crazy, no matter how much we may disagree with one another, we are to love one another with the same self-sacrificing passion Jesus has for us. This command is even more demanding and rigorous than the great commandment! Absent constant humble prayer and reliance on the Holy Spirit, absent Jesus Christ living in us, we cannot hope to fulfill it. But it’s hard for we human beings to rely on the God you can’t see. That’s why something else that transpired on the first Maundy Thursday, something not recorded in John’s Gospel, is so important. Unlike John, Luke records how Jesus and the twelve apostles celebrated the Passover together that night. At the table, Jesus told the twelve how eager He had been to partake of Passover with them. He wanted to have it with them before He suffered, Jesus said. Undoubtedly, these words were jarring and made the twelve uneasy. But Jesus went on to explain that He would not be enjoying a feast of this kind again until He had ushered in the Kingdom of God. Bringing the Kingdom of God--the reign of God, the freedom of eternal forgiveness and new life--to human beings otherwise lost and shackled to sin and death, was Jesus’ entire mission. It was the whole point of His entering our world. It was why He had come to Jerusalem, where He would die on Good Friday, lie dead in a tomb on Holy Saturday, and rise on Easter Sunday. Jesus would die and rise to bring His eternal kingdom to those who dare to repent and believe in Him. Of course, Jesus’ disciples were always lost when He told them that He would be rejected by the priests and elders, be crucified by the Romans, and rise from the dead. And when Jesus said that, after dying, He would be resurrected, it didn’t register with the disciples. Jews who believed in a resurrection thought that there would be a general resurrection of all believers at some point. They didn’t know what to do with the idea that one Man--in this case, Jesus--would rise first as, in a phrase Saint Paul would later use, “the first fruits" of the dead. In any case, Jesus’ talk on that first Maundy Thursday must have frightened the disciples. The hopes that Jesus had raised through His preaching, teaching, healing, exorcisms, and raising of the dead were going to be dashed? Jesus was going to leave them alone? Had they come this far, the disciples must have wondered, only to be abandoned by Jesus? The celebration of Passover involved the drinking of four cups of wine. Jesus instituted Holy Communion between the third and fourth cups of His celebration with the disciples. In doing so, Jesus spoke words that were strange to the disciples and, if we allow ourselves to truly listen to them and not treat them like church words that wash over us, can seem strange to us too. The God we can’t see comes to us “in, with, and under” the bread and the wine, the God of flesh and blood Who says that whenever His Word, the words of institution meet the bread and the wine among His believing people, He is there! Now, there are some Christians who believe that when they take Holy Communion, they’re remembering what Jesus has done for them, or remembering Maundy Thursday, like friends reminiscing about days gone by or like historians rummaging through the archives of history for cogent lessons. Remembering is nice. It can even be helpful, even, when it comes to the study of history, essential. But none of this is what Holy Communion is about! Jesus says, “This is My body...This is the new covenant in My blood.” Holy Communion isn’t about remembering a past event. It’s experiencing the present-tense presence of Jesus as we receive His body and blood with believing hearts. When we receive the sacrament trustingly, Jesus is here, now, as close as the person sitting next to us, as close as the hearts beating in our chests. Just this past Saturday, I was able to share Holy Communion with Phyllis at the hospital, just three days before she died. I can assure you that she wasn’t focused on the past when she received the sacrament. She was focused on the Lord Who was with her at that moment and the future heavenly banquet that this feast foreshadows for all who trustingly surrender to Jesus and His Lordship over their lives. Yes, people say, but didn’t Jesus say that we are to do the sacrament “in remembrance of Him”? He did. But we must understand two things here. First, Holy Communion isn’t something we do. Without Jesus and His powerful word, bread and wine are still just bread and wine. We don’t do the sacrament; Jesus gives it, He gives Himself, to us! Holy Communion is something that Jesus does; we are its recipients. Second, the word Jesus uses which we translate as remembrance is, in the original Greek of the New Testament, a form of the word anamnesis. This word tells us that Holy Communion isn’t something for us to remember Jesus by, like a souvenir from Disney World or the lock from a deceased loved one’s hair. Instead, Holy Communion is the means by which Jesus re-members us to Him and re-members us to the Church on earth and in heaven, re-members us to the body of Christ made up of saints below and saints above. I don’t know about you, but in my everyday life, I get so caught up in everyday life, that I sometimes start to fall apart at the seams. I fragment. I worry. I get upset. Sometimes I get angry. I sin. When we humbly and unrepentantly come to Jesus as He offers His body and blood to us in Holy Communion, He pulls the fragments of our souls together. He makes us whole. He heals our souls. Feeding us on one holy food, Jesus makes us one with Him, one with our sisters and brothers in Christ, one with our true and best selves. And in this way, Jesus holds us close and assures us that we are not alone. Holy Communion is the visible means on this earth by which He enacts the truth of God’s promise, given both in Deuteronomy of the Old Testament and Hebrews of the New Testament: “Never will I leave you; never will I forsake you.” No matter what happens to us, even on the brink of our deaths, Holy Communion proves that that promise is true, which is why Phyllis received the sacrament so gratefully this past Saturday. This GIF, shared by my son over on Facebook, is hysterical! "Sanctification" is the process by which sinners like me, who have been made right with God (justified) by God's grace (His charity) through faith in Jesus Christ, are, often against our wills, often in surprising ways, often through pain, hardship, and our unwilling-yet-resigned-yielding resistance of sin, are made over by the Holy Spirit to conform to the image of the Holy Spirit. Martin Luther described sanctification by saying that the Christian submits to being "the Holy Spirit's workshop." That probably gives a good idea of the process: To fit us for eternity, God starts here on earth by beginning a makeover on us. There's a lot of hammering, sawing, remodeling...along with falling, dropping, squirming, and ego-bruising...that has to happen. The apostle Paul describes sanctification in eloquent terms in 2 Corinthians, using as a starting point the fact that, in Christ, believers are afforded a privilege not even Moses had: to be in intimate proximity to God's blazing glory without being burned out of existence. Christ died in order to give all who believe in Him what Chuck Swindoll has called "intimacy with the Almighty." Paul writes: "And we all, who with unveiled faces contemplate the Lord's glory, are being transformed into his image with ever-increasing glory, which comes from the Lord, who is the Spirit" (2 Corinthians 3:18). Sanctification most assuredly is a glorious process, a bit like a mouse being transformed into a steed for Cinderella's carriage by the supreme power of God's grace. And it is solely the work of the Holy Spirit done in the lives of those willing to welcome Jesus into the centers of their lives. But given my sin, my resistance to authority (even God's authority), my shortsightedness, and the desire to "be like God" I inherited from Adam and Eve, I'm sure that, from the standpoint of God, the process of my sanctification often looks as awkward, plodding, painful, and silly as this man doing battle with an escalator. God help me. Today is Maundy Thursday and tomorrow brings Good Friday. Each day is uniquely important. On the first Maundy Thursday, while celebrating the Passover with His disciples, Jesus gave Christians a new commandment: that they love each other with the same passionate self-sacrifice with which He would enact His love for them on the cross. He also instituted Holy Communion, the means by which He gives His body and blood to believers, imparting forgiveness, new life, and the companionship of the Church, Christ's people, as He does so. Jesus did this in order to set free those who turn from sin (repent) and believe in Him (which means really, to trustingly surrender our lives and wills to Christ), from our inborn slavery to sin and self-destruction, from death, from an eternity without God. Jesus gives us everlasting life, His constant presence, and purpose as we follow Him. Both Maundy Thursday and Good Friday worthy of marking. Please plan on participating in worship on both Maundy Thursday and Good Friday, at a church near you. When you do so, the meaning of Easter will be enriched for you beyond measure. 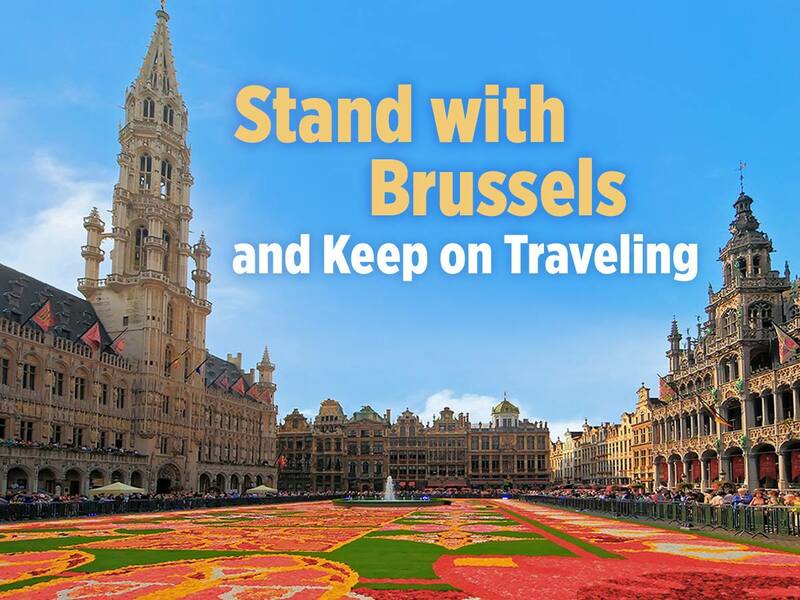 Travel expert Rick Steves shared this graphic on his Facebook timeline. To me, it expresses an important message on this day when we grieve the senseless loss of life perpetrated by ISIS. The object of terrorists is to incite terror, panic, and fear in people. Such reactions are understandable. But when we alter our lifestyles to accommodate the possible actions of thugs and bullies, they win and we lose. I'm not suggesting that either individuals or governments act stupidly. When the devil tempted Jesus to jump from the pinnacle of the temple in Jerusalem to see if God the Father would catch Him, Jesus refused. He told the devil that it isn't right to test God. So, people and governments need to take wise precautions in the face of the terrorist reality. But if you're planning on traveling by any means, if you have tickets for a major public event, if you have to go shopping, or if there are things you need to do to live your life, I say do them. Both are fearful prospects fueled by fear which would change the fundamental qualities of living in a pluralistic democracy that includes both majority rule and a fair regard for the minority. There are many things that give rise to Islamic-based terrorism. But among them is the palpable fear that potential terrorists see in free societies when terrorist acts do occur, something that offers them the possibility of feeling powerful. The fear of free societies is one of their greatest recruiting tools. Terrorism must be fought on many fronts and in many ways. One of the ways is for we who value freedom and the sanctity of human life not to let fear get the best of us. Like any other human being, I fear many things. But my faith in an eternal God Who raised His Son Jesus from the grave and promises a piece of His resurrection victory to all who repent and believe in Him, helps me to put my fear in perspective. As Archbishop Desmond Tutu once said, for the Christian, death is not the worst thing that can happen. 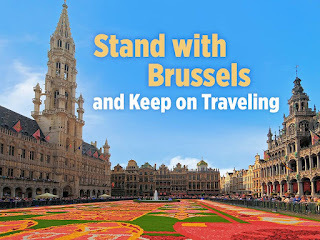 In the weeks prior to September 11, 2001, my daughter and I were trying to decide whether to book a flight to Germany. September 11 was the deadline we had set for making our decision. We booked the flight that night because, we said, we didn't want Osama bin-Laden making our travel plans for us. God has given you life. And if you're a follower of Jesus Christ, you believe that God has given you life with God that never ends. So, live. Just before today’s gospel lesson containing Luke’s account of Palm Sunday, we read about Jesus meeting a man named Zacchaeus. Jesus was passing through the city of Jericho, heading for Jerusalem. Zacchaeus climbed into a tree to get a glimpse of Jesus as Jesus walked by. Zacchaeus, you know, had gained his riches by extorting more taxes from people than they actually owed. He wasn’t popular in Jericho. But Jesus invited Himself to Zacchaeus’ house. It helps us to understand Luke's account of Palm Sunday if we first understand what happened between Jesus and Zacchaeus. You might think that Zacchaeus’ first impulse would be to tell Jesus to find somewhere else to stay. He had only climbed the tree to see what all the fuss was about. Besides, he could see by Jesus’ attire that Jesus was just a poor Galilean, while Zacchaeus was filthy rich. Yet Zacchaeus doesn't react as you'd expect! All of us have the same choice in this life that Zacchaeus had to make at that moment. We can choose to receive Jesus trustingly or not. “Here I am!” the risen and ascended Jesus is recorded as saying in Revelation 3:20, “I stand at the door and knock. If anyone hears my voice and opens the door, I will come in and eat with that person, and they with me.” He does so because He wants to come into our lives, be our Savior, our best friend, and our King. Whenever you and I get lost, wandering far from God by engaging in unrepentant sin, God can find us again! Through Jesus, God can find any willing to be found by grace! Not everyone was happy about the change that had come to Zacchaeus’ life. Not surprising. The moment you feel that you’ve been made clean by the forgiveness and grace God gives through Jesus, that's when the devil, the world, and your sinful self will start grumbling. Bet on it! "Who are you to receive God’s forgiveness?" the grumblers inside and outside of us demand. They evidently didn’t know that sinners are the only kinds of people to whom the God we know in Jesus Christ goes. And it’s only when you’re a sinner and you know it that you’re ready to welcome Jesus and His grace for you! It’s interesting that, as we come to our gospel lesson, Jesus was walking from Jericho to the Mount of Olives, moving toward Jerusalem. About 1200 years before the birth of Jesus, God’s people entered the Promised Land from the east, crossing the Jordan to face the walled city of Jericho. Jericho had to be conquered so that God’s people could take the land. The leader of the Hebrews was Moses’ successor, Joshua. His name in the Hebrew language was Yeshua, meaning God saves. It is the same name as that of Jesus. In the Hebrew language, Jesus’ name was also Yeshua. When the Joshua of the Old Testament prepared to enter the promised land, you’ll remember that he sent two spies into Jericho. Twelve-hundred years later, Jesus needed no spies. He knew everything that was going to happen. He knew where His enemies were. But Jesus did send two disciples ahead of him. He instructs the two disciples to find a colt in a nearby village, presumably Bethany. It would, Jesus tells them, be tied, and would be an animal on which nobody had previously ridden. That last bit of information is important: Jesus, God in the flesh would be the colt's first rider. This is part of a pattern in Jesus’ life on earth. When Jesus was born, He came from a womb that had never known sexual intimacy. The things of God must always be first, holy, and set apart. Jesus is, as the New Testament book of Hebrews calls Him, our pioneer. Jesus writes new histories for those who repent and believe in Him, making of each us a new creation. The two disciples find everything as Jesus has told them. They bring the animal back, throw their clothes on it, and set Jesus on it. This is how royalty and revered priests rode into Jerusalem. It’s important to point out a couple of things that are unique about Luke’s telling of Palm Sunday. First, there’s no mention of palms. Second, he doesn’t mention the crowds shouting, “Hosanna.” And third, in Luke’s telling, only the disciples welcome Jesus, not the crowds. That doesn’t mean that there weren’t palms, hosannas, or welcoming crowds. It does mean that Luke wants to focus on other things about Palm Sunday, things that he foreshadowed in the events in Jericho surrounding Zacchaeus. Using the words of Psalm 118, the disciples welcomed Jesus to the holy city. As subsequent events would prove, they didn’t totally understand what was going on. Some thought that Jesus was going to start a revolution and throw out the Romans. None would have predicted Good Friday or Easter. At that moment, they knew very little. But they knew enough to praise Jesus. We don’t know what lies in our immediate futures either. We don't know what God has in mind for us. We don't know what valleys or Good Fridays this fallen, sinful world may mete out to us. For all we don’t know though, we should know enough to praise Jesus! We should know enough to welcome Him into every part of our lives. But don’t expect the devil, the world, or even our inner sinful rebels to take the suggestion of welcoming Jesus as Lord and King over our lives very readily! We want to be kings of our own lives, which is why around this time every four years, most presidential candidates fall all over ourselves stroking our egos instead of telling us the whole truth. Verse 39: “Some of the Pharisees in the crowd said to Jesus, ‘Teacher, rebuke your disciples!’” There will always be people who grumble about the joy Christians know in Christ. Fact is, we all can be grumblers, at least some of the time. The reason for that is simple: If you dare as a Christian to live in daily repentance and renewal, you can count on God to confront you for your sins, even as He embraces you in His grace and love. God loves sinners, but God still hates sin and always will. By His grace, through Jesus Christ, God is committed to removing sin from our lives. But none of us likes being separated from our sins. We get comfortable with them, you know. They become part of us, if we’re not careful: the compromise in business ethics; the stolen lustful glance; the indifference to the state of our own souls; the failure to pray for or help those in need. In Romans 8, the apostle Paul says that the whole creation--even, I suppose, the rocks--groans under the weight of human sin and waits eagerly for the children of God to be revealed clearly on the day of Jesus’ return to this world. So rocks that cry out aren’t so far-fetched after all! Please, though: Don’t let inanimate stones take your job! It’s our job and our joy to welcome Jesus into our lives and, like Zacchaeus to tell others of our thankfulness that Jesus--God in human flesh--went to Jerusalem, to suffering and a cross, to hell itself, and then rose from death to set us free from sin and death. This week, I invite you to focus especially on welcoming Jesus into your life. I ask you to do that in a few simple ways. First, I hope that you will be at both the Maundy Thursday and Good Friday services. The two days mark different events and have different themes. Both can deepen your walk with Christ. Second, ask Jesus to show Himself to you in people in need. Jesus says that whatever we do to the least, we do to Him. Third, ask Jesus to show you those places in your character where You need to welcome Him as Lord. Maybe there’s a sin of which you need to let go, a lack of compassion for those who differ from you, an indifference to the people you meet in life’s everyday places, or simply not spending time with God in His Word and prayer. Welcome Jesus’ correction. Finally, if there's a hurt that won't go away, a broken heart that it seems will never heal, welcome Jesus into that hurt. Let Him love you. Let Him heal your broken heart. Welcome Jesus to reign over you this coming week and see what He does. Welcoming Jesus into the center of our lives: That’s what Palm Sunday is all about. Amen!